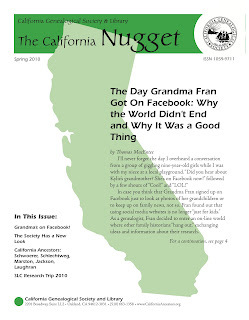 Writing, editing, formatting and printing of the Spring 2010 edition of The California Nugget is complete and copies should be arriving at members' homes any day. 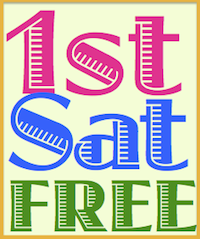 Kudos to Editor Jane Hufft and Production Editor Lois Elling for another outstanding issue! For 2010 both issues will have green covers, signaling freshness, renewal, and growth in the articles and information we present for our readers. May this inspire your research to bloom! The cover article is an informative and entertaining piece by Thomas MacEntee: The Day Grandma Fran Got On Facebook: Why the World Didn't End and Why It Was a Good Thing. Thomas is a "far-flung" member of the California Genealogical Society who lives in Chicago. The California Nugget is a benefit of membership in the California Genealogical Society. It is published twice a year. Love the title of the cover article. I can't wait to get my copy. Thank you to everyone who worked so hard on the issue. Can't wait to get my copy either! Amy, I agree. Thomas has done it again. Cheryl, A little bird told me they were mailed out yesterday. Should be coming soon!